Mark Billingham introduced the closing event at Theakston’s, and what an event to go out on– Jo Nesbo being interviewed by Mark Lawson. When Billingham mentioned Nesbo’s achievements in life thus far, it was hard not to feel a slight twinge of jealously. A freelance journalist, rock star, stockbroker, footballer and extreme sports enthusiast, it’s difficult to believe when you see him that this man is 52. He looks in great shape, but in his own words he is ‘slowly falling to bits’. Nesbo revealed how he came to novel writing quite late. On a trip to Sydney he started sketching out a story at the airport and was thoroughly hooked on writing it by the time he finally arrived at his hotel. The setting provided the story, with Nesbo writing of how his now legendary Norwegian detective Harry Hole is sent to Sydney to investigate the murder of a Norwegian celebrity, his investigation leads him to explore the Aboriginal myth of The Bat-Man. 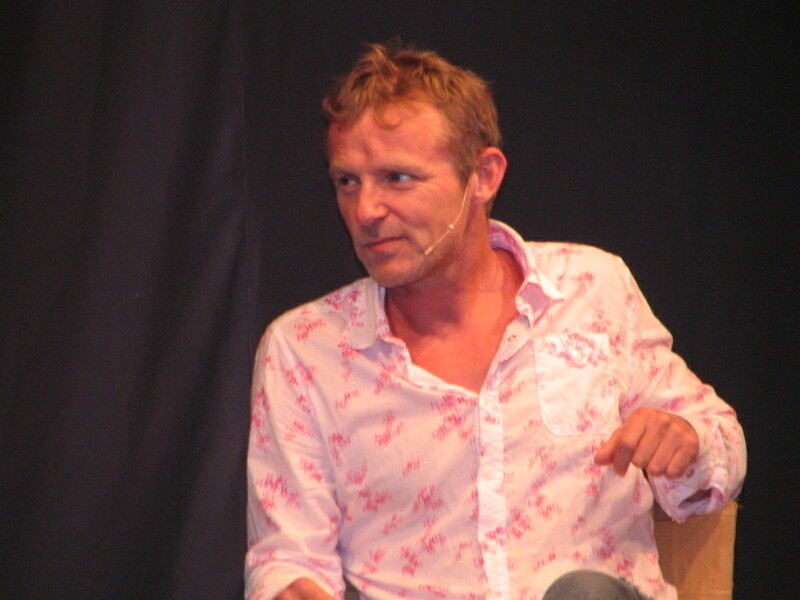 When he finished the manuscript, Nesbo expected it to be politely rejected by publishers, but he had hoped they would have some words of encouragement for him to continue writing. To his surprise, The Bat (as it is known in the UK) was published, and Harry Hole is now one of the most famous fictional detectives of our time. Interestingly, Nesbo now regards airports as one of his favourite places to do some writing. Although he claimed to be quite a formal writer, working from a synopsis, writing in airports sometimes gives him the energy and productivity that every writer craves. He also mentioned how Headhunters had been a work in which he felt completely unemcumbered by convention, and he was determined to push the lead character to the limits of human endurance. If you have read the novel or seen the film of Headhunters, you will be left feeling exhilarated by its style. Nesbo talked more about his life, divulging lots of fascinating information which I had not known before. His mother’s family had fought with the Norwegian Resistance during the Second World War, but it was only when he was 15 that Nesbo discovered his father had fought with the Germans on the Eastern Front and had spent two years in prison upon returning to Norway at the end of the war. Nesbo spoke movingly of how as a child he had always thought of the German soldier as evil-looking in their imposing black uniforms and steel helmets, a view that was perpetuated in post-war Norwegian culture. Now he had to come to terms with the fact that his father had fought with them. But he grew to love his father again when he explained to Jo why he had done it: his father had grown up in the US in a staunchly anti-communist family. Thus, when the Germans invaded and occupied Norway, he leapt at the chance to fight the Russians. His experiences on the front, particularly during the Siege of Leningrad were horrific, and he admitted that his time in prison was a fairly light punishment for the crime of betraying his country. Nesbo worked this material into his Harry Hole novel The Redbreast. His father had planned to write a novel about his wartime experiences but died of cancer the year he retired. The Theakston’s festival closed on the first year anniversary of the Oslo bombing and Utoya massacre. Nesbo discussed the effect that this tragedy had left on his country. He had noted previously that as a young country, (Norway became independent in 1905) Norwegian culture had looked for heroes, firstly in the Arctic explorers and then in Resistance fighters, while overlooking the level of collaboration with the Germans that had taken place. Utoya was as shocking to the national psyche as the assassination of the Swedish Prime Minister Olof Palme was to Sweden in 1986. Lawson asked if the massacre was like a Kennedy moment, will everyone remember where they were when it happened? Nesbo said that the explosion was felt quite far throughout Oslo, and he was dangling from a rope inside a local gym when it happened. However, he played down the Kennedy comparison. Norway is still a peaceful and prosperous country, and people want to continue their lives in much the same way as they always have. He talked of the concerted effort by Norwegians not to give mass murderer Anders Breivik more attention than he deserves. All in all, this was a thrilling and engaging interview that was the perfect event to close what has been a brilliant Theakston’s crime writing festival. For more information on this interview, Mrs Peabody Investigates has an excellent write-up on her blog.